Swear to drunk, we're the champs! 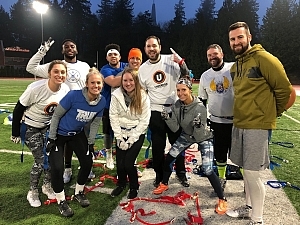 March Madness may be boring and lacking for upsets, but our co-ed winter league was full of surprises. 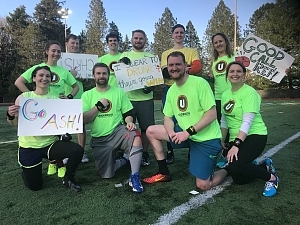 Swear to Drunk began with a play-in game and needed to win four games in two weeks to win the title. They did just that. In the title game, it came down to Swear to Drunk and the potent offense of Any Given Sunday. AGS had been posting 50 point games and winning nailbiters in the playoffs. Swear to Drunk exhausted all their weaponry, but they found a way to top the division's most dangerous offense and roll to the league title!